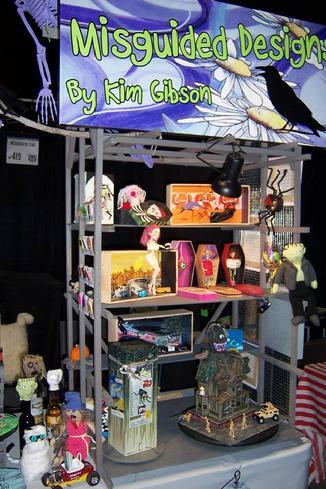 It was fantastic meeting new friends and sharing my artwork with everyone at the Mission Viejo Holiday Boutique. My unique artistic view of the holidays came to life. Thank You to everyone at the Norman P. Murray Community Center for supporting the artists. A scream was had by all at the Midsummer Scream Halloween event in Long Beach, CA. 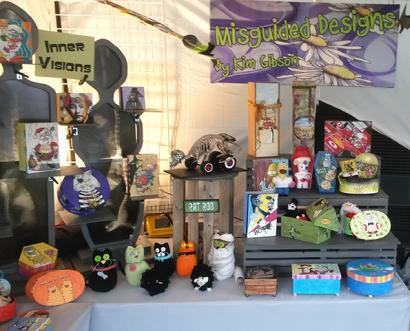 Thank you from Misguided Designs to all who came out to see the wonderful costumes and vendors who normally aren't seen until October. We did have to keep the lights down inside the venue for this one for our own safety. If you love Halloween and missed this show, word is, the planning has already begun for next summer's event. Stay tuned! We had a great weekend at the Bernardo Winery Fall Arts and Crafts Fair. A big thank you to the wonderful staff at the winery and all who came out to support the artists. Hope to see you all again at the spring arts and crafts fair. My 2009 Alternative Christmas tree was featured in an LA Times article written by Jessica Roy on December 19, 2015. 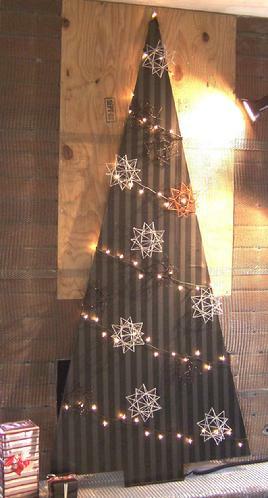 This tree was made from a piece of masonite and covered with striped wrapping paper. The three dimensional stars are made out of toothpicks. Add the lights and you have an industrial look. It stands in front of my fireplace that was in the process of a redo at the time. Misguided Designs first show on the road, October 2014. Mickey, Sponge Bob and Homer Zombies! Three of my zombie icon projects were accepted for display and competition at the 2014 Orange County Fair: Walt Disney's Brain, SpongeBob Deadpants and Homer's Conscience. 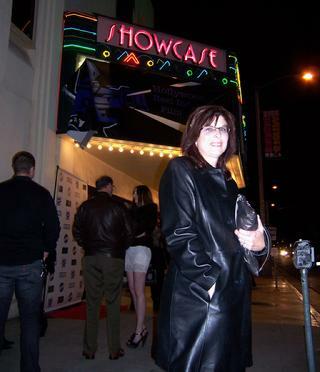 December, 2010 -- I would never have imagined that my art would connect me to a Hollywood film premier! I was commissioned to produce three keepsake boxes for the writer, producer and director of an independant film titled 'Peach Plum Pear' by the writer's mother. She was so happy with the boxes that I was invited to attend the film's Hollywood premier at the 'Hollywood Reel Independant Film Festival' on December 16th. As it turns out, 'Peach Plum Pear' won honors for Best Film and Best Actress (Alanna Masterson) and was a smash hit of the festival! It was really exciting to be even a small part of this event, mixing with industry movers and shakers. The boxes were presented to the three talented 20-something women and I am told they loved them! I am so proud and grateful to know that my work is appreciated by other creatives who, just like me, work hard to follow their dreams. Me looking sleek in Black leather. That's NOT Hillary Duff back there... or is it? 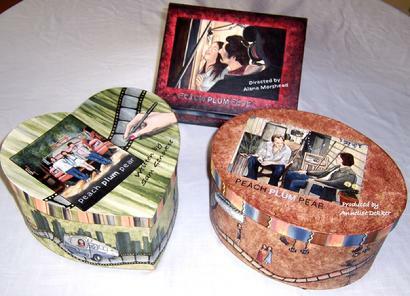 Each box was painted with a scene from the movie 'Peach Plum Pear'. It was fun to watch these scenes in the film! 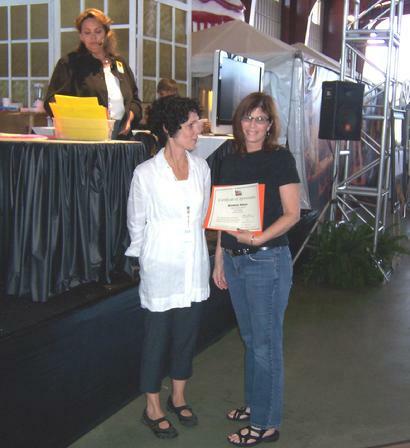 July, 2010 -- We had a great time at this year's Orange County Fair, and not only because my artwork won Overall Division Winner, Tole Painting. We usually go every other year, but since this was the first time I had entered any of my work, we wound up going twice! Here are a few images taken while we were walking around. Naturally, we enjoy the crafting and art displays most, along with the livestock show and people-watching. The food is always a big draw, especially the Heart Attack Cafe, a place we stayed away from. I didn't get my funnel cake this time and boy, did I miss it! 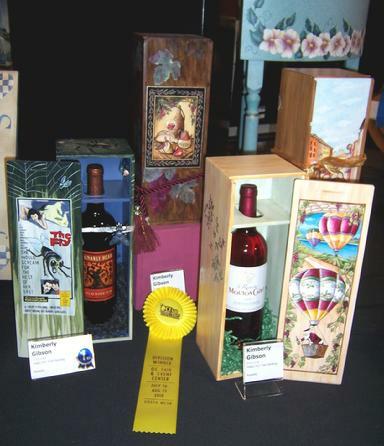 My handcrafted and handpainted wood wine boxes on display at The OC Fair. First Place in category, Overall Division Winner, Tole Painting. 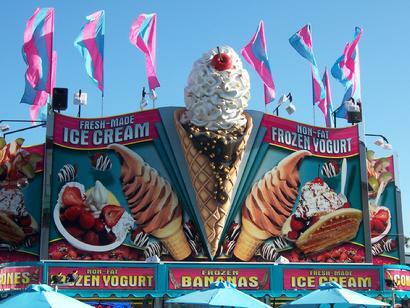 The giant food signs are works of art in themselves. 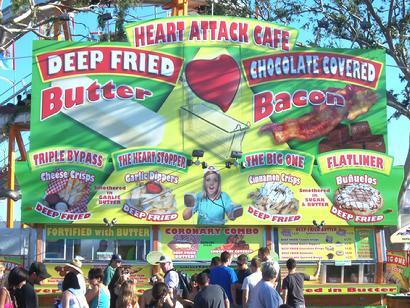 The Heart Attack Cafe sign speaks for itself. I finally decided to take the plunge and teach myself to play the accordion. I've been thinking about it a lot, especially since we've been listening to so much Latin and World music lately. 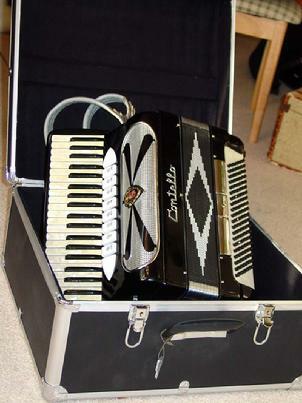 Our great friend John happened to have this beautiful Contello accordion in his storage unit, and he graciously loaned it to me. Thanks, John!